I bought some for a friend as a gift, and am now totally wishing I had treated myself too. Good news is, not only are the PJs fantastic but Pajama City also has super customer service. First, the PJs arrived with a pre-printed returns form, in case you need another size, with no re-stocking fee and a price guarantee. Then, I got an email saying they were refunding $1.80 in shipping charges, because it cost less to ship than they thought. $1.80 isn't a huge refund, but that's kind of the point. They could have kept it, but didn't. Sho, these are definitley the strangest thing I've seen... Very Cute - I'm not sure hubby would appreciate me wearing these to bed!! My hubby bought me a pair with little piglets on them from Jammerz, and since I am cold from Oct - April I wear then often. Highly recommended!! 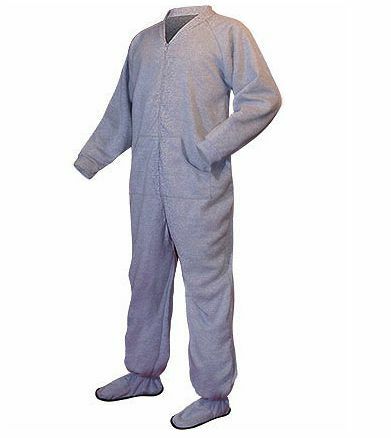 YEAH Adult ONESIE!!!! If I had only read your blog earlier, I would have clued in to what my bday present was! You're the best sis in the wholewideworld. Love the new look of the blog! Full disclosure: I may or may not have been wearing something warm, fuzzy and with buttflap when I wrote this. Okay, I was.